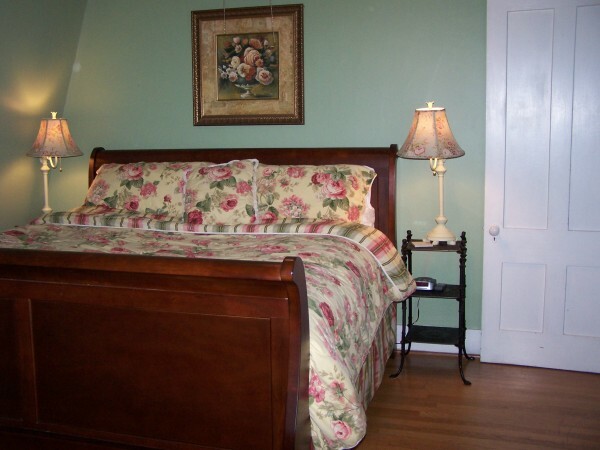 Here at the Candlelight Inn, we want to make your stay is a wonderful experience you will not forget. Each suite holds a unique characteristic and comfort. Please review our accommodations and select your room. This spacious suite, originally the master bedroom, features a beautiful king size four-poster bed decorated in Victorian colors of hunter green and rose. A private bath in gray and rose marble, equipped with a rain head in the shower completes the luxurious feel of this room. A full size sofa and oversized chair allow for relaxation with your favorite book or for watching TV. 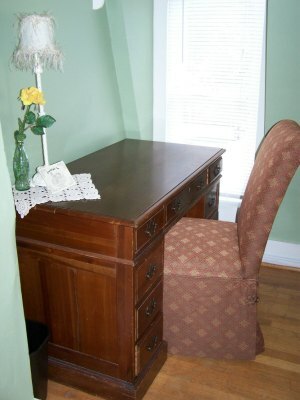 This room also offers an antique desk for any work you may need to catch up on. Rate: $120.00 per night for the Master Suite with a King size bed. 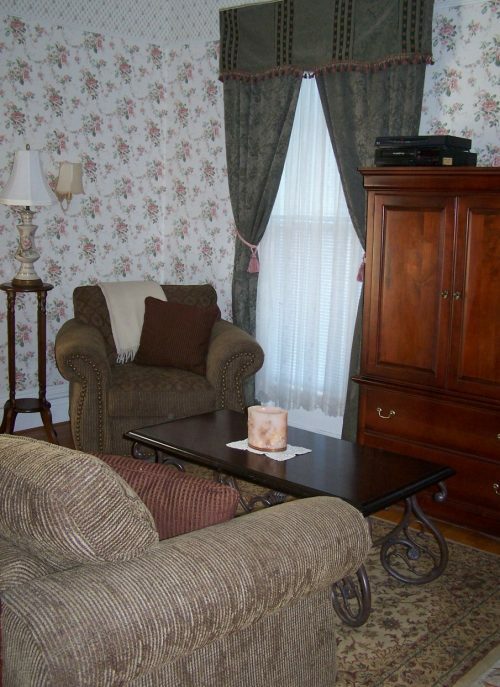 All of the rooms at the Candlelight Inn have air-conditioning, a television, luxurious bed linens, and spa towels. 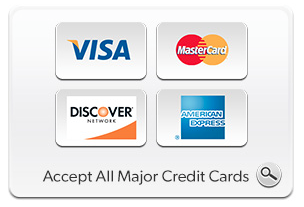 Each room also provides a CD alarm clock, shampoo, conditioner, bath gel, lotion & complimentary bottled water. A Queen size cherry sleigh bed dressed in beautiful sage and lavender bedding is flanked on either side by matching nightstands. A soft floral wallpaper in a light lavender and sage green add to the soothing feel of this room. A chair nestled in the corner of the room provides a great place to enjoy a good book, relax or watch TV. 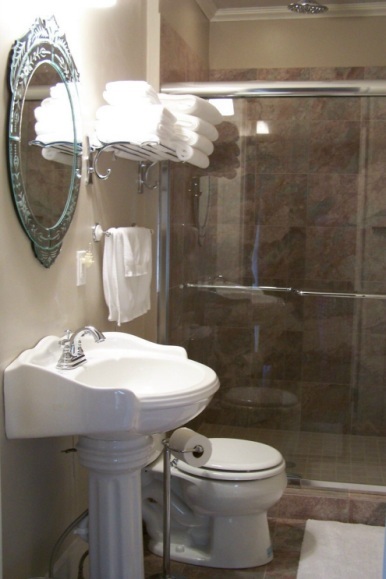 The Lavender Room has it's own private bathroom with a 4 foot tile shower with rainhead. 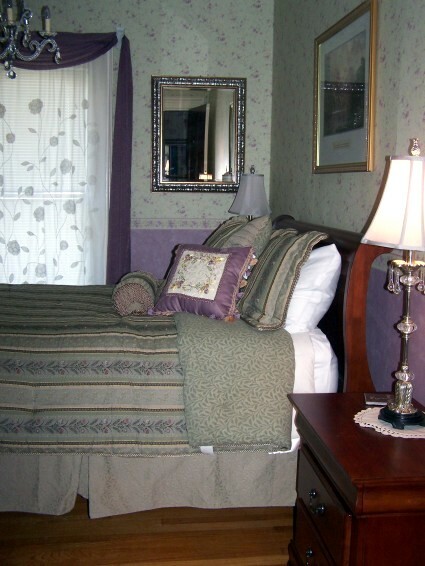 Rate: $105.00 per night for the Lavender Room with a Queen size bed. Classic shades of sage green and rose make this room restful and serene. The room features a queen cherry sleigh bed topped with a vintage style quilt. 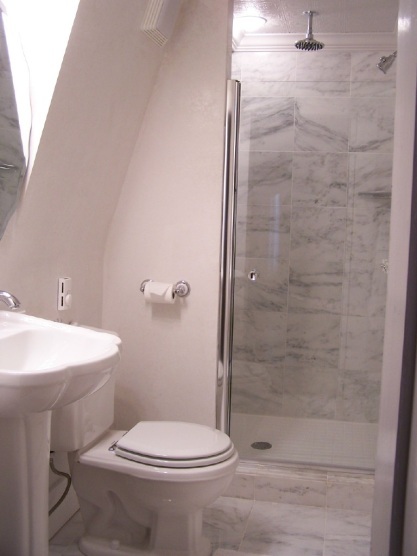 A private white marble bath with a rain shower head add to the comfort of the room. 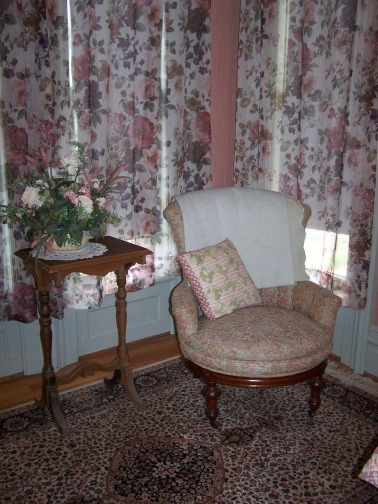 An antique Victorian chair sits in the large sunny bay window giving a perfect place to sit and read or watch TV. 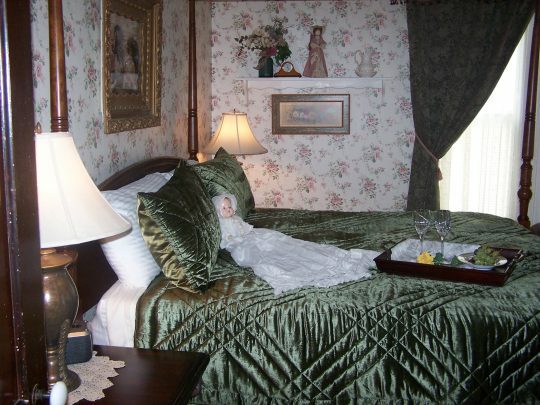 The room is decorated in images of dolls and vintage linens, which give the room a feel of a time gone by. Rate: $105.00 per night for the Doll Room with a Queen size bed. point. 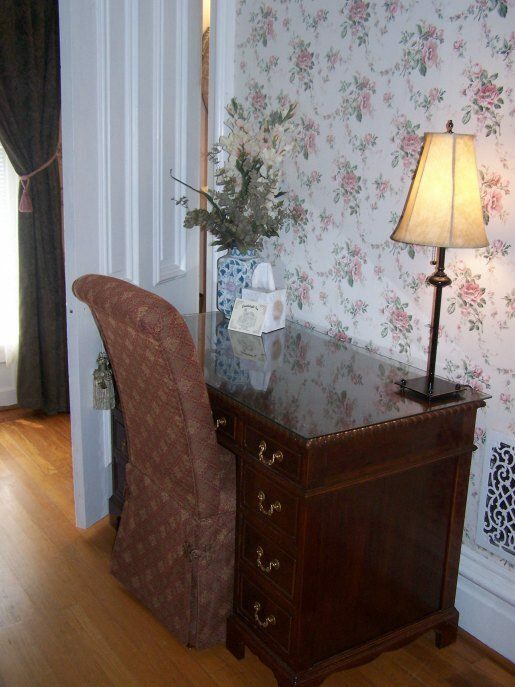 The room offers an antique desk for your convenience. Western Room next door to create a private suite. 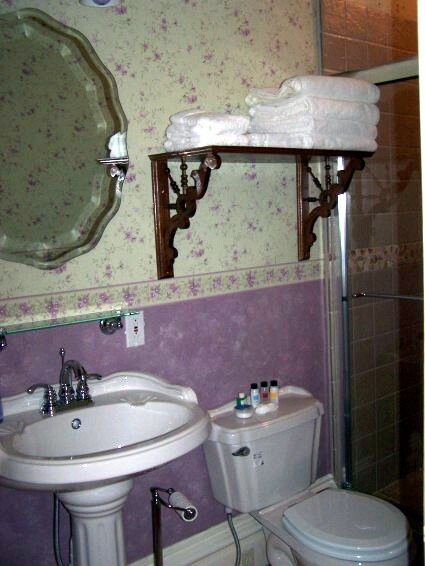 A bathroom right outside the door is shared by both rooms. 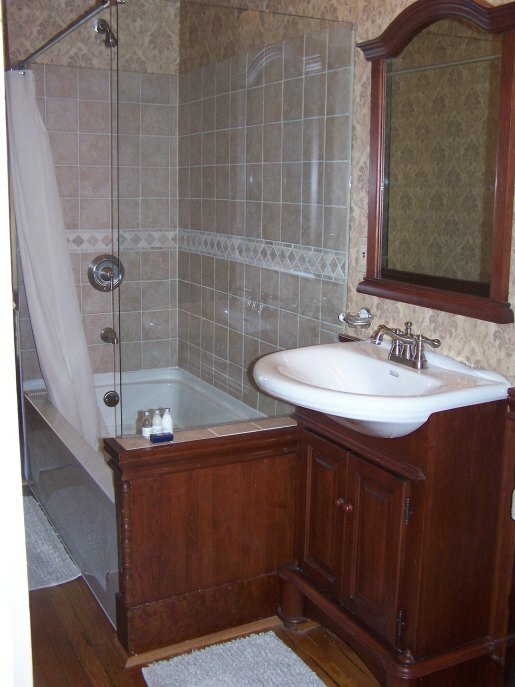 The bath offers a deep soaking tub and a shower combination. Rate: $105.00 a night for the Garden Room with king size bed.